Ranunculus Asiaticus or Persian Buttercups. Ranunculus Asiaticus or Persian Buttercups can brighten a Texas winter like no other flower! That is because ranunculus produces prolific 3” to 4” ethereal blossoms borne on 12” to 18” stems in show-stopping pink, red, rose, orange, white, and yellow. They look too delicate and special to grow over the winter. But don’t let appearances fool you. These flowers are durable and flower repeatedly beginning in late January through March. 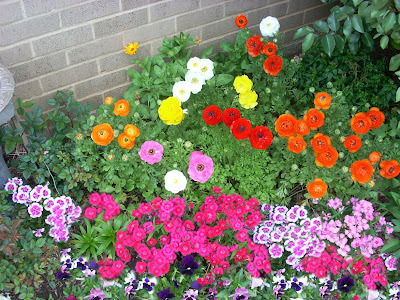 They also grow well in containers and make great long-lasting cut flowers. Ranunculus tubers look like little brown bunches of bananas.Tubers can be bought in nurseries and home and garden stores in the fall for as little as $6.00 for 35 small tubers. They can also be grown from seed. When choosing tubers, make sure they are not too dried out (crunchy). The size of the tuber has much to do with the number of flowers each plant will produce. 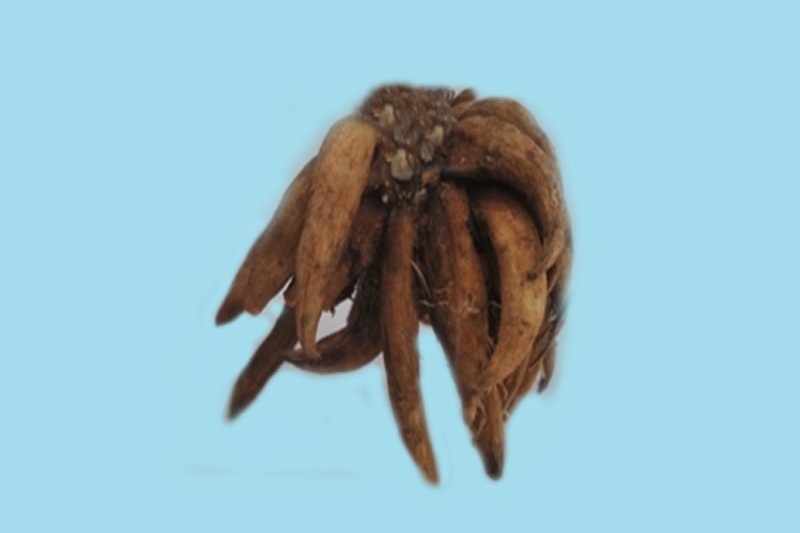 For example, a jumbo tuber can produce as many as 35 flowers, while a small tuber can produce 12 or so flowers. Small tubers measure 1-1/8 to 2 inches. Ranunculus plants can sometimes be found in the nurseries and home and garden stores in February, but they will cost between $6 and $7 each. Plant tubers with the top of the banana bunch up (or claw-side down), in well-drained soil, in full sun in late September or October (before the first frost). Some people recommend pre-soaking the tubers in water before planting, but I do not think this is necessary as the tubers will become moist when they are watered after planting. Ranunculus tubers can also rot easily, so they should never be planted in a place where standing water has been observed. Ranunculus plants in Mid-December (3rd row from the front). 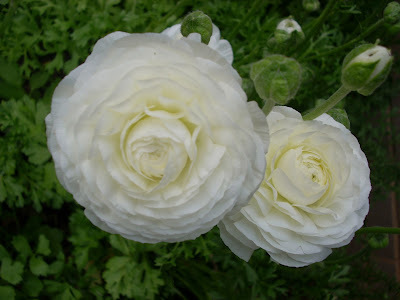 Plant ranunculus tubers to a depth that is 3 times the width of the tuber and space them at least 8” apart. Water them after planting. Tubers can be planted directly in the winter flower bed or in pots. Planting them near the foundation of the house is a good idea because this location provides a degree of wind protection for blossoms. 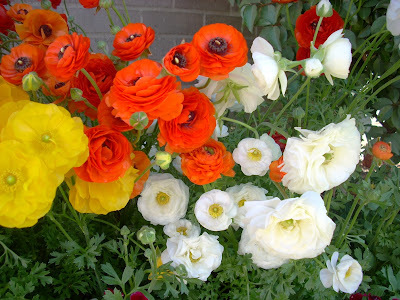 If your flower bed is still occupied by summer/fall annuals, you can just pre-plant the ranunculus tubers as transplants in large flower pots or planter boxes. 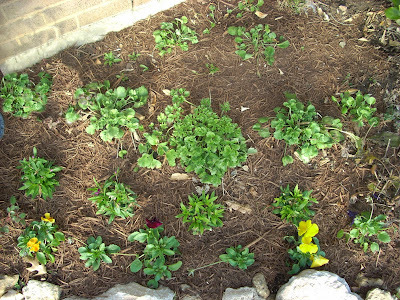 After the first frost kills the annuals (usually late October or early November), you can move the transplants into the now open flower bed. I also have ranunculus's that have been left in my flower beds for over 3 years now. They just begin to sprout in the fall from the tubers that went dormant in the late spring. So, as I am cleaning out the annuals that were just killed by the first frost, I am delighted to see the green parsley-like foliage of ranunculus sprouting in the flower bed. When the ranunculus tubers have sprouted several leaves, they are large enough to transplant. Transplant them on a warmer day. 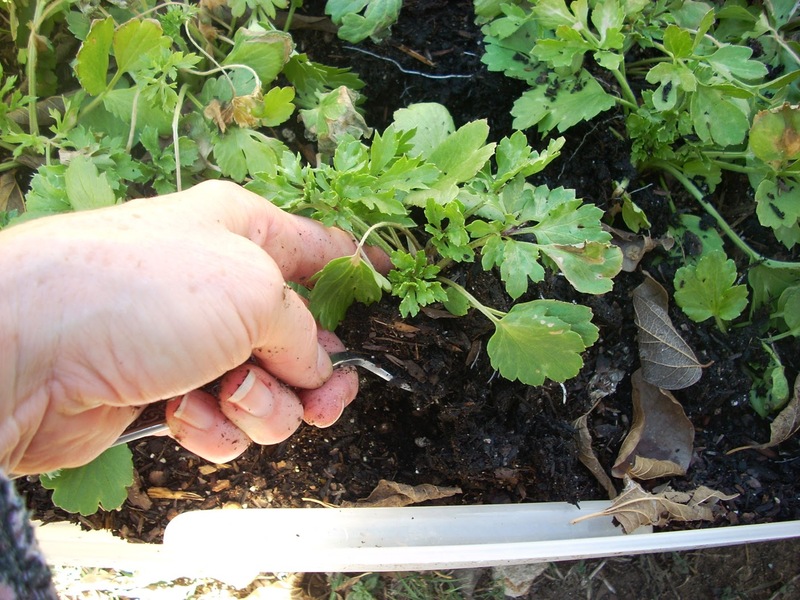 A dinner fork makes an excellent transplanting tool. Place the fork 2” or more from the base of the sprouted ranunculus and sink it straight down into the soil and lift the transplant out of the ground. Plant the transplants to the same depth as they were planted in the planter box in well-drained soil in full sun at least 8” apart. Water after transplanting. Orange Ranunculus bloom and bud. 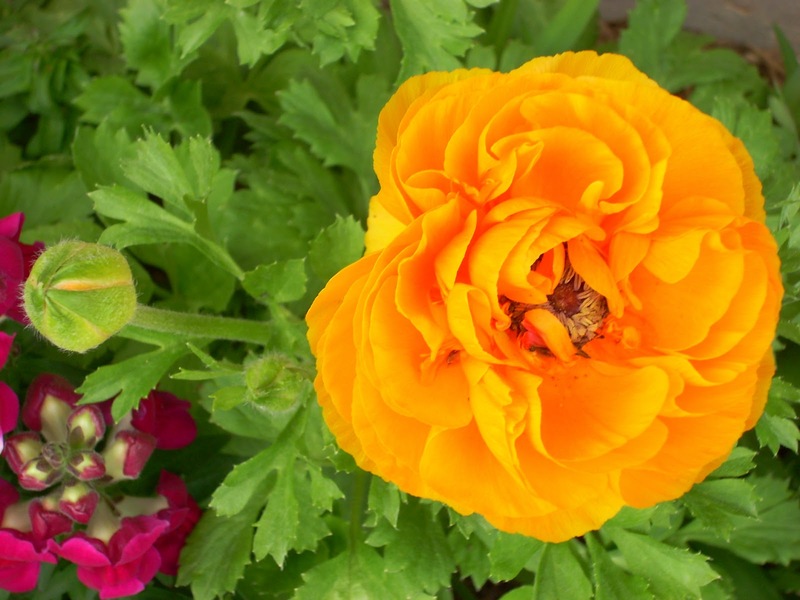 Your ranunculus plants should first begin to bloom at the end of January. Each plant will be loaded with buds and send out successive blooms well into March. The blossoms remind me of poppies but with more petals. The blossoms are long-lasting and durable. Ranunculus make great cut flowers as the stems are long and strong and the blooms can remain colorful and upright for as long as seven days. Ranunculus blossoms are also highly prized for beautiful wedding bouquets. Winter flower bed. From the front: pansies, dianthus, ranunculus. Most gardeners will just treat the ranunculus's as annuals and pull the plants up after they have finished blooming. Other gardeners will pull up the plant after it has dried up and cut the foliage from the tuber and save the tuber in a cool, dark place for planting again next fall. If you are lucky enough to have well-drained soil that can sustain the tubers throughout the year, then you can leave them in the soil as I do and enjoy them as perennials every year. 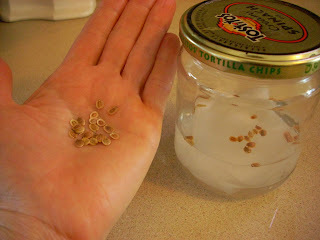 Soaking parsnip seeds overnight to speed up germination. Parsnips are a wonderful crop to grow through the winter in Texas. In fact, cold weather imparts the parsnip root with a sweeter flavor! Parsnips can be planted in the fall and harvested in early March so that the bed is available again to grow spring vegetables. Parsnips prefer full sun and rock-free soil that contains some organic compost and is dug to depth of 18”. The addition of organic compost will improve the crop and make the ground more conducive to growing longer and straighter roots. 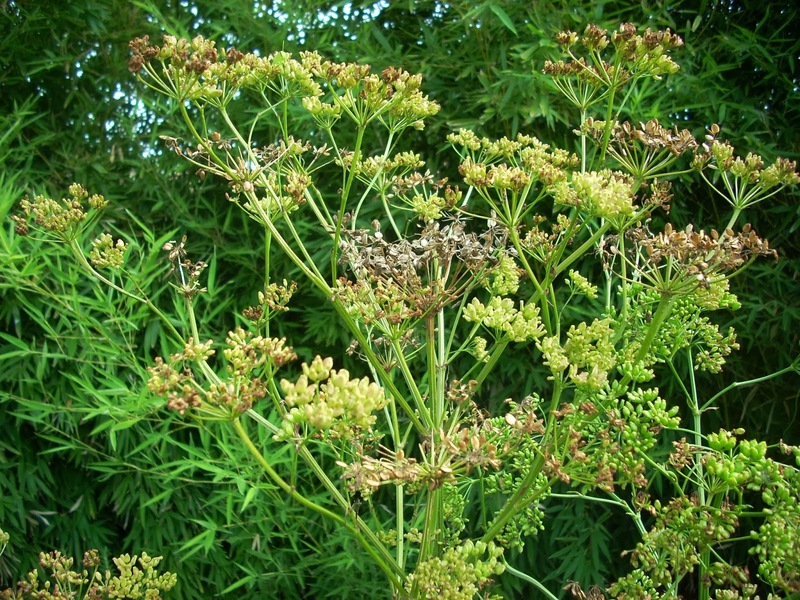 Plant parsnip seeds in late September or October (before the first frost). 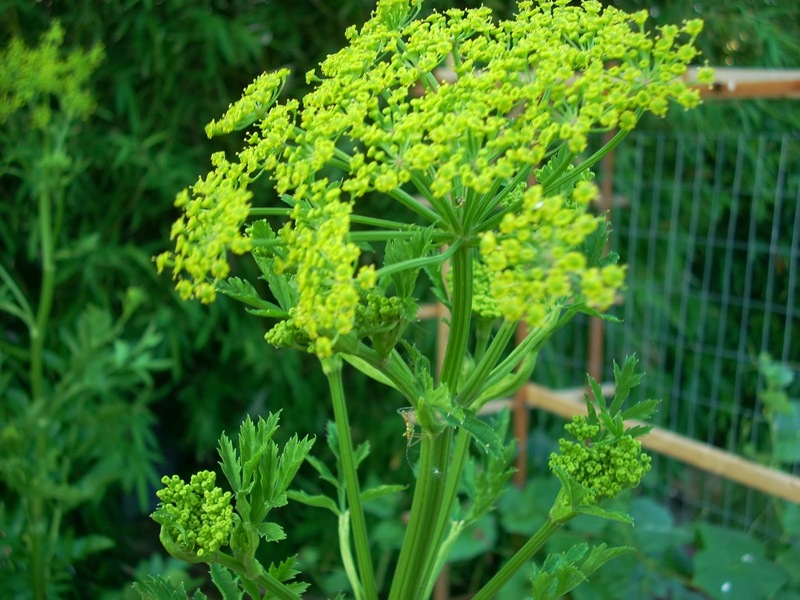 Be sure to use parsnip seed that is not more than a year old. Parsnip seeds lose their viability quickly. 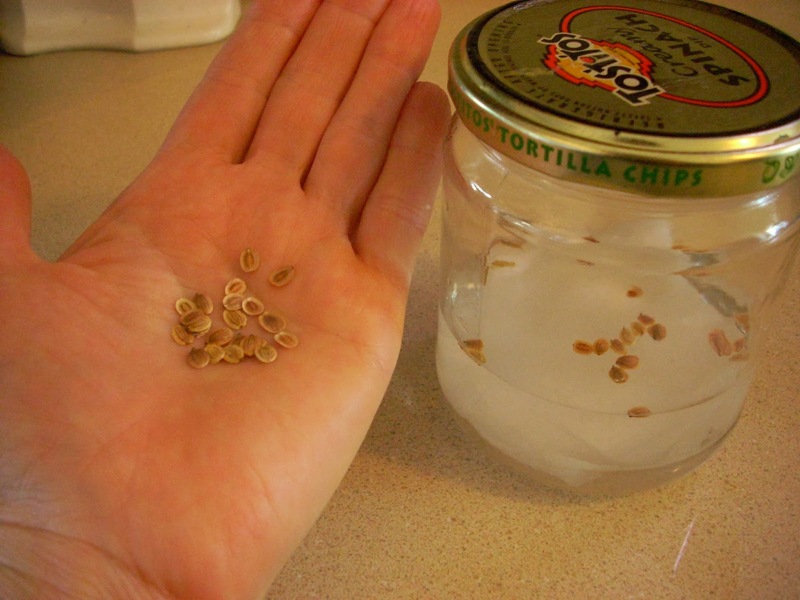 Soak parsnip seeds overnight before planting to reduce the amount of time it takes for them to germinate. Germination can take up to 3 to 4 weeks, or longer if the soil temperature has not cooled to their preferred germination temperature. Plant the seeds 1/2” deep and leave at least 6” between plants and space rows 18” apart. Since my parsnip beds are not very wide and I can reach into them easily; I did not leave a large row space between them, but I do have 2’ walkways around each of the beds. Be sure to thin the plants because if they are too crowded the roots will be more spindly. 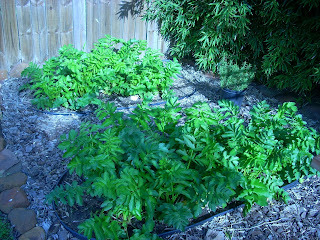 Water parsnips as needed during the winter. Parsnips develop better when they have enough water. Harvesting: Parsnip varieties take between 110 to 150 days to mature (this is another reason why it is perfect to grow them during the fall/winter in Texas). 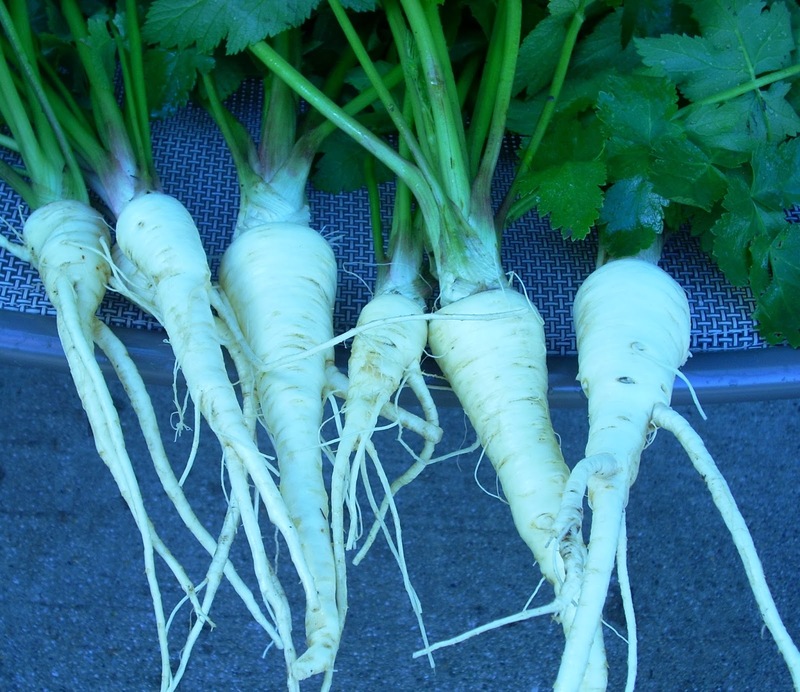 You can begin to harvest parsnips earlier if desired (the roots will just be smaller). Parsnips with harvest-sized roots will usually have leaf stalks between 12” to 15” tall. You can also gently dig around the top of the parsnip root with your finger to see the width of the top of the root. This technique will not disturb the growth of the plant and give you a good idea of how large the root has grown. If the root is about 1.5” to 2” in diameter it is a good size to harvest. 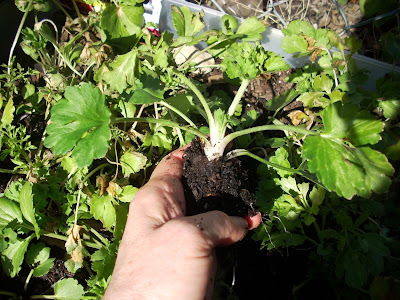 If the root is still too small, just push the dirt back over the top and let it grow some more. Very large roots will not have as much flavor as smaller ones. Use a shovel to harvest parsnips. Place the shovel in the ground at least 4” from the wall of the parsnip and push the shovel straight down into the ground and lift the parsnip root out. Warning: The leaves and stems of parsnips contain a juice that can cause Phytophotodermatitis in some people. Phytophotodermatitis happens when the sun interacts with the juice on the skin causing a reaction that resembles sunburn spots. These spots can also develop blisters. This is much less of a concern for garden parsnips compared to wild parsnips, but just to be cautious I wear rubber gloves while harvesting parsnips and do not wipe my face or eyes during the process. In Texas, it would also be a good idea to choose a day or time to harvest when the sun is not as intense or hot. Sometimes I also cut the stalks to about 4” long before I dig the parsnip so that I will not be bending over and crushing the leaves near my face or under my arms as I pull them out of the dirt (just less contact). Now cut the entire stem off each of your parsnips and wash the dirt off the roots with the water hose. Parsnips can be stored in plastic bags in the refrigerator crisper for several weeks, or stored up to six months in a root cellar environment. Don’t store parsnip roots with apples, tomatoes or bananas. They produce ethylene that may impart a bitter taste in the roots. Parsnip roots are no longer edible when the plant begins to send up central shoots that will in turn produce flowers. If you have grown your plants from heirloom seeds and want to grow seed for next year’s crop, then let one of the plants develop flowers and so seeds. The flowers are a lovely yellow and attract butterflies and honey bees. The flowers will turn into light green seed pods. The seeds are ready to harvest when they turn golden brown and begin to open. To harvest the seeds, clip the seed heads off with scissors and place them in a paper bag. Shake the seeds out in the bag and then collect them in a paper envelope. Store your seeds in a cool, dry and dark place until you are ready to use them to plant your next crop. Cooking with Parsnips: Parsnips make delicious soups. I especially like parsnip soup with curry. Parsnips can also be roasted with other winter vegetables or fried like potatoes. A link to some yummy parsnip recipes from Epicurious is listed below. Fall and winter are some of the best times to grow salad greens in Texas! Why? Because salad greens thrive in temperatures between 40 to 70 degrees and withstand light freezes (to 28 degrees), without any protection. 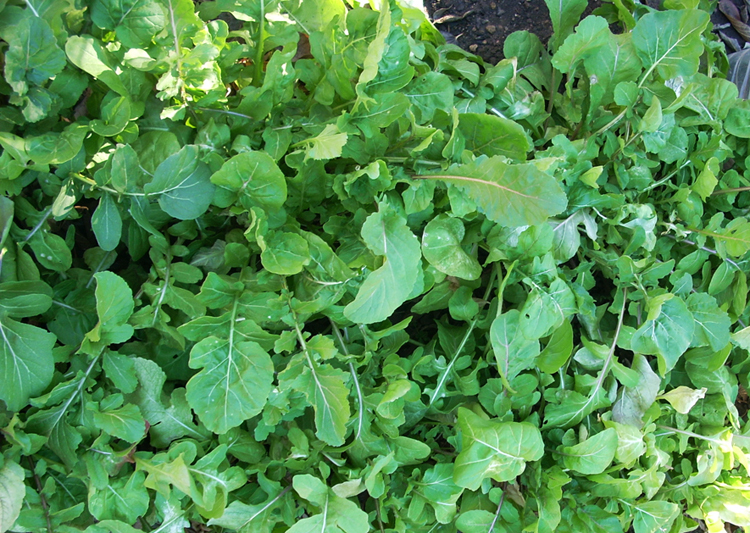 The cooler temperature also insures that the crop of salad greens lasts longer because hotter temperatures make them go to seed (bolt), and become bitter and inedible. You can enjoy fresh, endless greens from November to early May! 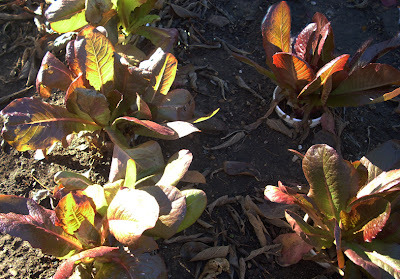 No pests will be alive after the first frost to eat your salad greens. 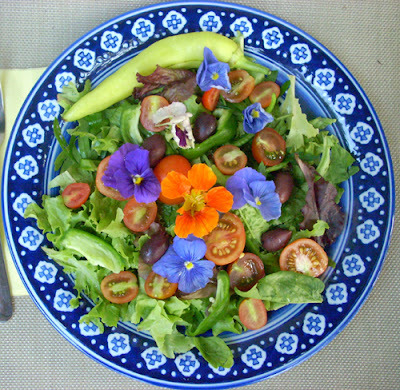 Home grown salad greens are fresher and are said to contain more vitamins and minerals than those bought in the store. pansies (blue), and nasturtium (orange). This salad was actually made in the spring. All ingredients are home grown except the olives. Some of my favorite salad greens are Lolla Rossa (red loose-leaf lettuce), Royal and other Oak Leaf lettuces, Four Seasons lettuce, Swiss Chard, Spinach (Bloomsdale Long Standing), and Roquette. All of the lettuces and other greens are loose-leaf varieties. Colorful and mild tasting Four Seasons lettuce. Roquette is a fast-growing, zesty, peppery tasting green.. It is also known as Arugula in Italy and Rocket in England. I prefer to grow loose-leaf varieties because I can harvest the outer leaves when needed without harvesting the entire plant. New leaves are always growing from the center, so taking outer leaves does not disturb the growth. This practice of only harvesting the outer leaves insures that you have a continuous crop with no downtime while you wait for a new plant to grow to maturity. Here are some other loose-leaf lettuce varieties from Cooks Garden. Cooks’ Heatwave collection would be good for Texas. Plant from seeds in late September and in October in a sunny location. Plant lettuce and roquette seeds 1/8” deep and spinach 1/2" deep and thin to 6” apart and leave between 8” to 1’ of space between rows. Plant Swiss Chard 1/2" deep and 8” to 1’ apart with 18” between rows. Do not plant spinach and Swiss Chard next to each other. Lettuce and roquette seedlings should emerge in a few days, while spinach and Swiss Chard emerge in 7 to 10 days. Once your lettuce, spinach and roquette are 6” tall and the Swiss Chard is 8” tall you can begin to harvest outer leaves. 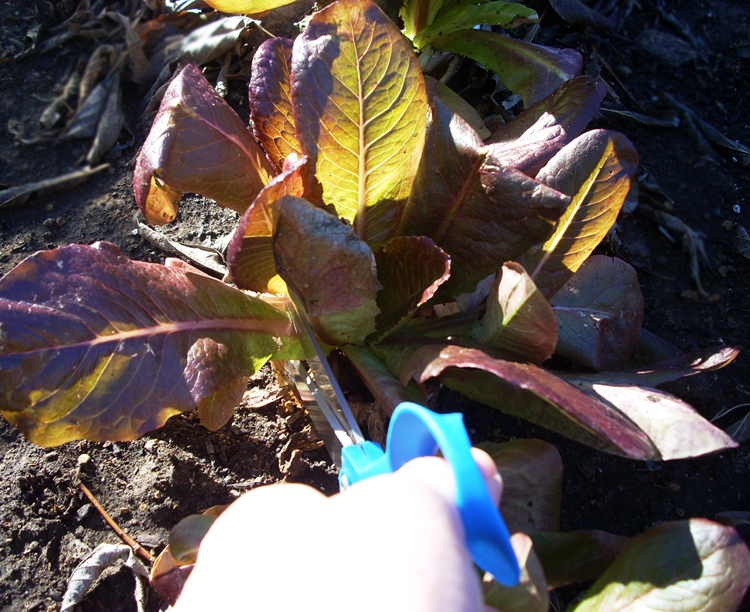 Use a pair of scissors to gently clip off the outer leaves within one inch from the base of the plant. Harvesting an outer leaf of Four Seasons lettuce. to move the leaves around a little more to find outer leaves in this situation. As stated earlier all of the salad greens will survive a light freeze (to 28 degrees), without any protection, but some will need a little more protection for temperatures that are colder. All are cold hardy to 25 degrees except Bright Lights Swiss Chard which is cold hardy to 28 degrees. 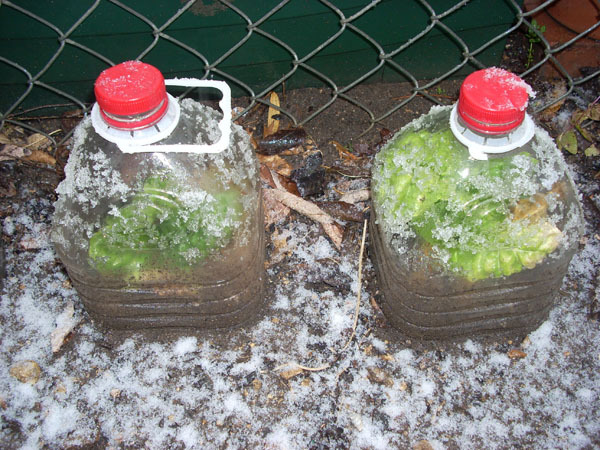 If snow or ice are expected or the temperature falls to 25 or lower for the lettuce and 28 or lower for the Bright Lights Swiss Chard you will need to provide some protection for them. You can simply put a blanket over the plants for the night. Remove the blanket after the snow or ice has melted or the temperatures are above 28 degrees. Also make sure to water your greens when the ground is even slightly dry. Greens that have enough water in their cells can withstand freezing weather much better than a dry plant. Floating row covers are also good for protecting your plants. These are simply frost fabric draped around metal hoops. The material and hoops can be bought at a nursery or online. Here is a description of them from Gardener’s Supply. 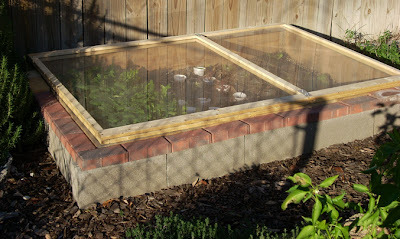 A cold frame is basically a south facing box set partially into the ground with a plexi-glass top that creates a protected and warmer growing environment for plants during the winter. It is perfect for winter greens. If ice or snow is expected, just shut the lid. Most of the winter, I have the lid propped open a few inches. This way the salad greens are more protected and kept warm. During our 70 degree winter days, I open the cold frame door all the way. The cold frame needs to be built in a sunny area in the south so that it can collect as much sun as possible. The cold frame works by passive solar means. The sun enters through the plexi-glass top during the day and the heat is stored in the ground. When the temperatures drop at night the heat is released into the inside of the cold frame to keep the plants warmer than that outside temperature. It is an amazingly simple and fun gardening structure. My cold frame measures 4’ wide by 6’ long. This size is large enough to raise enough salad greens for a family of 4. Lettuce and spinach are all spaced approximately 6" apart to take advantage of the space. I usually plant my most prized lettuce varieties and spinach in the cold frame and plant taller Swiss Chard and durable roquette and parsley in the regular garden beds (and cover if needed). Some past Texas winters were so mild that I did not need to cover the greens outside the cold frame even once. Don’t have a cold frame, then make cloches from clear plastic bottles. Cloches are like mini-greenhouses. Just cut the bottom off the plastic bottle and voila, you have a cloche. Water bottles with the bottom cut off make great cloches. Put one cloche over each plant. Push the cloche in the earth at least a half an inch so that they don’t blow off. Leave the lid off at all times except when ice or snow is expected. When ice and snow are forecast, just put the lid on and take it off after the snow melts. If a plant gets too large for the cloche the edges of its leaves can get a little freezer burned if they are pressed to the edge of the cloche and ice or snow form on the outside. The leaves are still edible-just cut that part off. 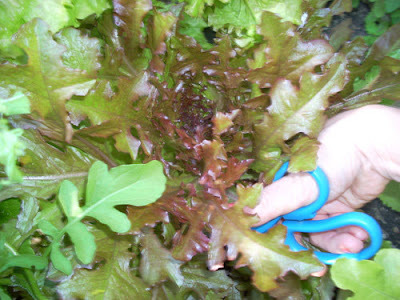 When you get ready to pick some salad leaves, just remove the cloche and clip off a leaf or two with the scissors and then put the cloche back over the plant. When watering plants under cloches, just sprinkle water in through the top hole. I cup my hand over the end of the water hose and funnel the water into the holes of the cloches. 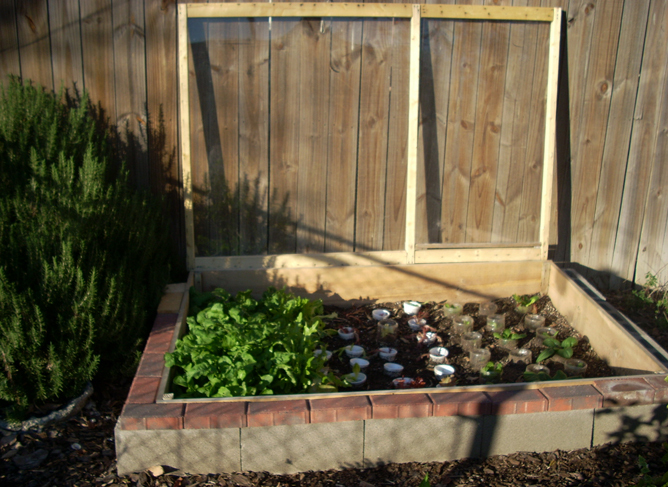 This is really easy if you have arranged the plants/cloches in a row. Good luck to you. I hope you have fun growing and eating your salad greens.